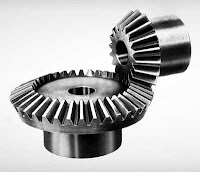 Mechanical transmission devices are the basic devices which are used in every machine to transfer power from one part of machine to another part of the machine. By using different kind of mechanisms and motions we can use these devices effectively. These mechanisms are used parallel and the motion is transferred. There are several combinations and or modifications possible but there are six basic types of mechanism. Crank mechanism The main element is the crank which is rotated and mounted on the frame and is so designed that it can perform complete revolutions/rotation, and its motion is transmitted through the coupler rod to the lever arm, like wide rotatable mounted, but not performing complete revolutions. Other alternative is, instead of being connected to a lever, the coupler may be attached to a sliding element like a piston, in a steam engine or internal combustion engine. 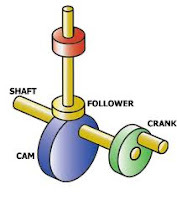 Gear Mechanism This type of mechanism transmits circular motion from one shaft to another, usually in conjunction with a change in rotational speed and torque. Usually in a gear mechanism, the transmission is effected by the meshing of gear teeth, but in the friction-gear mechanism this positive drive is replaced by frictional contact of wheels or rollers. pulley mechanism Connection between the pulleys on the respective shafts is effected by flexible elements like belts, rope, etc..
Cam mechanism A cam plate mounted on a frame is driven and thus moves a lever or slider which thus performs a desired predetermined motion depending on the shape of the cam, for example like valve control mechanism in an internal combustion engine. 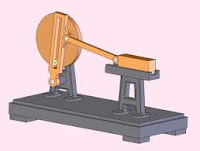 Ratchet mechanism this serves to arrest a motion or to produce an intermittent circular rotation in the driven element. The pawl allows the ratchet wheel to rotate in one direction only preventing rotation in the opposite direction by engaging with the specially shaped teeth on the wheel. Screw mechanism when the screw spindle is rotated, the element attached to the nut will move in longitudinal direction of the screw. If the nut is rotatable mounted in the frame of the mechanism and driven, the screw spindle will move longitudinally. Great thoughts you got there, believe I may possibly try just some of it throughout my daily life.